Apologies to my veggie followers, this is a post you may want to skip. I am 'mainly vegetarian' - I think the term is flexitarian. I pick the veggie option where ever possible, and mainly cook veggie myself, but I do include some ethically sourced seafood for variety and because the kids adore it. My own reasons for being a veggie are mainly based in animal welfare concerns and an attempt to reduce our impact on the environment, but I do understand that many hard line veggies don't want to see any animal products used. We're quite 'middle way' in most of our lifestyle choices, and this is my 'middle way' approach to dissection. I have dissected a few creatures at Uni, and can see that as a learning tool these dissections were useful, but I don't feel quite comfortable with using animals solely for this purpose at home. My solution is to do edible dissection. We go down to the fishmongers on the sea front and select a locally caught fish from our excellent local sustainable fishery - the fish is all caught using small beach landing boats. I ask for it to be scaled since this is a bit that results in scales flying everywhere when I do it at home, but no other preparation to be done by the fishmonger. 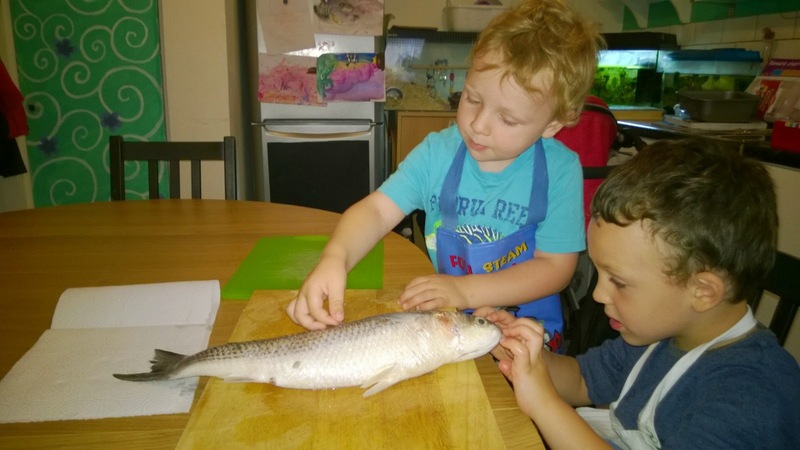 When we get home I let the boys have a thorough look at the fish, answering questions as they have them and asking prompting questions about form, function and lifestyle. For example with this Grey Mullet we observed dorsal spines and discussed their purpose, investigated the mouth and discussed the lack of big sharp teeth, looked at the streamlined shape of the fish and the purpose of the gills. We talked about the habitat of the fish and how it was caught. The grey mullet is a bottom feeder, and once you know that the lack of large sharp teeth and the dorsal spines make sense. After a good look at the outside, I opened the fish and we had a look at the organs. I then showed the boys how to fillet and debone this fish and Matt pan fried the fillets, which we had with mashed potatoes and local wild samphire. We hadn't tried mullet before and the taste was interesting, more like salmon than a white fish like cod. This is about as ethical as I can make a dissection and if the boys want to eat meat I think it's important they know what it is and how to prepare and cook it. As a society we have got so used to chunks of something that could be anything, wrapped in a coating and served in a bucket like pig swill, eaten without thought or respect. I'm not advocating total global veganism, but maybe we can slow down and raise kids who know enough about their food to want to be active consumers who eat things out of choice rather than just convenience. I also think that you can't beat hands on learning and that the combining of subjects such as science and cooking makes for a rounded experience that makes it easier for our brain to understand and retain the information that it is gathering. Safety bit: clean hands, work surfaces and utensils to avoid getting food poisoning. Also, some bits are sharp, e.g. scales, spines, teeth in some species so take care. Knives for filleting need to be really sharp, so I don't let the kids near when I'm doing this bit - they watch from a little distance. As kids get older they could help trimming fins with scissors and eventually be taught to use a knife for filleting, but as mine are 4 and 2 this is a long way off. If kids are really squeamish, don't force the issue - a light tough of the fish first time is enough and then sit a little way off to watch the rest. With repetition kids will generally lose any discomfort, but if they don't it's not a big deal - we're all made differently and maybe you have a little vegan on your hands. I discourage mucking around with the fish - a part of what I'm trying to instil is respect for the animal. Are cafe's a waste of money?